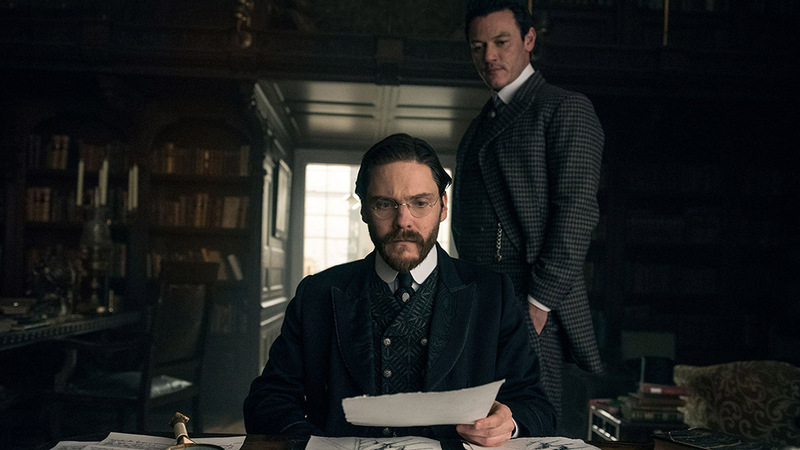 Adam reviews the seventh episode of the new TNT Drama The Alienist starring Daniel Brühl, Dakota Fanning, and Luke Evans. The series is based on the Best-Selling Novel by Caleb Carr. “I believe there are two reasons a man does what he does. The good reason and the real reason.” JP Morgan (Michael Ironside), The Alienist. The seventh episode “The Many Sainted Men” of The Alienist finds a city about to erupt. The working class citizen of New York City shocked by the events of the previous episode is on the cusp of rioting. Ms. Howard (Dakota Fanning) finds a breakthrough as she distances herself from the doctor after last week’s incident. Dr. Kreizler (Brühl) begins to understand not only the consequence of his recklessness but that his point of view has been skewed with the type self-aggrandizing hubris that he would detest in another. The hardest lessons learned are always the ones that that show us in the harshest of lights. This episode deals with Dr. Kreizler and the house of cards he has built. Not only the moment of violence between him and Mrs. Howard at the end of last week’s episode but the responsibility in Cyrus’ and Stevie’s wounds (physical and mental). Kreizler is uneasy and clumsy with these moments of apologies and resolution. The doctor is not fully at ease with both his responsibility but what he is criticized for. Kreizler thinks of himself as not only a progressive Doctor/Scientist but a progressive human being showing true care for not only his wards but the people in his “employ”. The moment between Howard and Kreizler when he slaps her at the end of episode six is the perfect example. The moment happens and it breaks a bond between the two that will never be reformed. The look on Kreizler’s face says it all. The knowing of the gravest of mistakes were made and the unwillingness of an arrogant man to do anything about it. Most actors would never play this moment that way. Brühl wants you to understand that moment and wants you to feel the ugliness of it. The delicate dance between Fanning and Brühl is heartbreaking. If one were to wonder why Daniel Brühl was cast as Kreizler it could be summed up with this episode’s exploration of Kreizler as a character and human. Many know Brühl from his work in Captain America: Civil War where he plays one of the primary villains of the piece. Even in a commercial, enormous bit of business like a Marvel film Brühl shows an uncommon understanding of even the most damaged of characters. His skill as a performer comes in that understanding and being able to display an uncommon apathy. As Kreizler, Brühl gives a guided tour of apathetic performances, never once asking for sympathies but always finding an understanding, though an audience may not like what is reflected back at them. Unlike many episodes of TV, The Alienist and Brühl do not resolve things in a tidy bow at the end of the episode. Kreizler’s final moments of the episode though quiet and possibly heartfelt do not absolve him, and he knows it. Brühl’s brilliance as a performer is to show that small moment, that complexity of a man trying to do what he can but is not it not being for altruistic purposes. There are many damaged characters on Television currently but none of them as complex and complete as Brühl’s Dr. Kreizler.